I’m part of a group of retired Washington editors and writers who get together once or twice a month for a sandwich lunch—we talk about current events and what’s happening in journalism. Who could we proudly vote for in the next election? What’s happened to working together for the good of the country? Where have all the good jobs for editors, writers, and reporters gone? We have lots of memories of good stories we wrote or edited, and we sometimes laugh about the less-than-great moments that are part of a journalist’s life. Mostly we know we were lucky to be editors and reporters before the digital revolution. We’d argue that journalism was better and more fun then. We had editors with b.s. detectors who pushed us to do all the reporting needed to get at both sides of a story. It was about respecting the intelligence of the reader. It was about reporting and fairness, not opinion or attitude. None of us expected to get rich or become stars on talk shows or Twitter. It was about doing good journalism. Yes, old journalists like to talk about the good old days—here’s a look back, first published in a 2012 issue of the Washingtonian, at what it feels like for an old editor to take his typewriter home. It finally happened. On Saturday morning, Jack came into the office, took me off the desk, carried me out to a car double-parked on L Street, and drove me away. I’m now on a beat-up typewriter table in what seems to be a basement office in a house. No car horns, lots of birds singing, and a dog that looks at me and occasionally barks. Not a surprise but still kind of sad. Sure, I was being used less and less, but I still felt useful–I was always really good at short notes. The first hint that something was changing was back in the 1980s: Jack was talking to a writer named Fred Barnes about joining the staff, and Fred asked if the magazine had computers. When told it didn’t, he said he couldn’t write on a typewriter. What kind of journalist would say that? Fred didn’t come to work at the magazine, but we did begin to buy some really dumb-looking computers. I remember hearing the salespeople say that if we spent $100,000 on their computers, we’d be able to save that much in salaries because the computers were so efficient. Ha! The staff is bigger than ever, and we now have two guys called IT managers and everyone treats them like the most important people in the office. Okay, we Royals were pretty simple, but does anyone remember that we never crashed? The only care we needed was a new ribbon a couple of times a year. When we needed maintenance, there was a place called North’s Office Machines on K Street. About ten years ago, Jack asked the man there where he found people who could repair typewriters. He said, “I have two Russian immigrants. 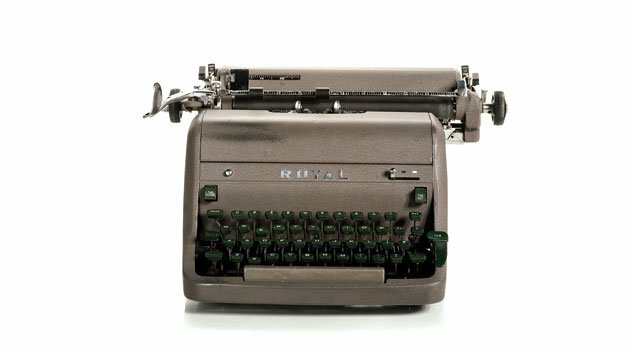 They love typewriters, and they can’t bear to see one tossed out.” I’m not sure why Russians love us so much–maybe we made a difference over there. I do miss the old days. On Monday mornings you could hear the typewriters in the office come to life. Phones started ringing. All the noise gave the place a feeling of life, of energy. Editors and writers walked around and talked with one another. Now on Monday mornings, people come in and it’s very quiet–they sit at their computers and the phones never ring. It makes me nostalgic for the wire-service days when the writers really used us. Plus there were 20 teletype machines in the bureau, and they sent out bulletins with three bells ringing. Some days there were news flashes with five bells. One thing I don’t miss: the cigarette smoke. I remember hearing writers say they couldn’t write if they couldn’t smoke–they meant it–and by the end of the day the air got pretty bad. But I loved the way they caressed my keys when they were thinking–that made it easy to handle the ashes. Enough. I know there’s no going back. Jack has been writing and editing on a computer a long time, and last summer he got an iPhone and began to use me to send people notes about Facebook and Twitter. Some days he didn’t seem to pay me much attention, and I felt a little hurt when visitors laughed at me like I was some Civil War relic.